Welcome to Mount Hope Estate and Winery in Manheim, Pennsylvania, located in Northern Lancaster County. You are invited to join us at what was once the summer home for four generations of the Grubb family. The properties that were to become the Mount Hope Estate were originally purchased in 1779, and today the property with its Federal Period Mansion and surrounding formal gardens, has grown to a flouring historic estate. Placed on the National Register of Historic Places in 1980, Mount Hope now hosts something for everyone year-round including outdoor festivals, an indoor theater, a craft brewery, a cidery, a winery, and now hosts a Victorian Tea. Relax and enjoy a Victorian Tea in this historic mansion with friends or family while interacting with Miss Daisy Grubb, (former owner of the estate), dressed in her Victorian finest. Daisy and a few of her friends will present an etiquette lesson, entertain you with stories of the Mount Hope Estate, and explain some of the history surrounding the English Tea. Before arriving in Manheim, Pennsylvania we first travel to Edwards Nut & Candy Company in Lancaster, Pennsylvania. Known for their large selection of candy, nuts, dried fruits and baking goods, Edwards Nut & Candy Company offers a shoppers delight with every visit! Later, on our way home, we treat you to a stop at Browns Orchard & Farm Market, nestled among the rolling hills and valleys of Southern York County. At this unique country market, you will find a wide variety of locally grown fruits and vegetables and much, much more, all under one roof. Bring along a cooler and take home some Pennsylvania Dutch foods, fresh baked breads, meats, soups, and salads made fresh daily. Welcome to Mount Hope Estate and Winery in Manheim, Pennsylvania, located in Northern Lancaster County. You are invited to join us at what was once the summer home for four generations of the Grubb family. The properties that were to become the Mount Hope Estate were originally purchased in 1779, and today the property with its Federal Period Mansion and surrounding formal gardens, has grown to a flouring historic estate. Placed on the National Register of Historic Places in 1980, Mount Hope now hosts something for everyone year-round including outdoor festivals, an indoor theater, a craft brewery, a cidery, a winery, and now hosts a Victorian Tea. Relax and enjoy a Victorian Tea in this historic mansion with friends or family while interacting with Miss Daisy Grubb, (former owner of the estate), dressed in her Victorian finest. 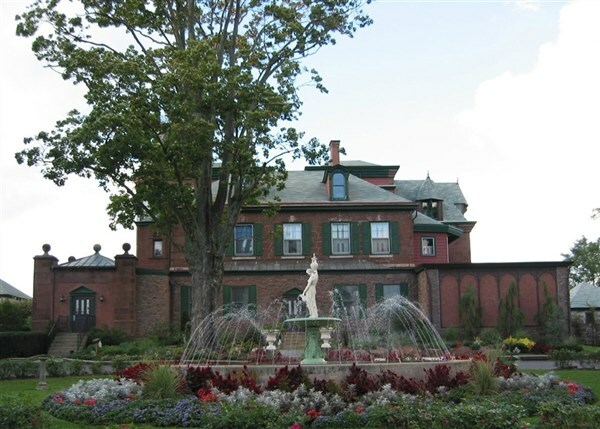 Daisy and a few of her friends will present an etiquette lesson, entertain you with stories of the Mount Hope Estate, and explain some of the history surrounding the English Tea. Before arriving in Manheim, Pennsylvania we first travel to Edwards Nut & Candy Company in Lancaster, Pennsylvania. Known for their large selection of candy, nuts, dried fruits and baking goods, Edwards Nut & Candy Company offers a shopper's delight with every visit! Later, on our way home, we treat you to a stop at Brown's Orchard & Farm Market, nestled among the rolling hills and valleys of Southern York County. At this unique country market, you will find a wide variety of locally grown fruits and vegetables and much, much more, all under one roof. Bring along a cooler and take home some Pennsylvania Dutch foods, fresh baked breads, meats, soups, and salads made fresh daily.